Bill O'Reilly Is Out At Fox News : The Two-Way Amid a sexual harassment scandal, 21st Century Fox has announced it's parting ways with the host of cable news behemoth The O'Reilly Factor. Tucker Carlson will take O'Reilly's old time slot. Bill O'Reilly attends a 2016 ceremony held by The Hollywood Reporter in New York City. Fox News is parting ways with Bill O'Reilly, who for years stood as one of cable news' most popular hosts. The network's parent company, 21st Century Fox, announced the move in a statement Wednesday. "After a thorough and careful review of the allegations, the Company and Bill O'Reilly have agreed that Bill O'Reilly will not be returning to the Fox News Channel," the statement read. O'Reilly released a statement, calling it "tremendously disheartening that we part ways due to completely unfounded claims. But that is the unfortunate reality many of us in the public eye must live with today." The host's top-rated program, The O'Reilly Factor, had recently suffered an exodus of advertisers amid revelations that O'Reilly, Fox News and 21st Century Fox had quietly paid out roughly $13 million in settlements to five women who had accused him of sexual harassment. Several weeks ago, a woman named Wendy Walsh stepped forward with another complaint against O'Reilly. NPR's David Folkenflik reports that Walsh went through Fox News' formal complaint process, alleging O'Reilly made unwelcome advances during what she believed to be a business dinner. "It was a sad cocktail party story that women tell each other and shrug our shoulders and go, 'Ugh, another one,' " Walsh told NPR earlier this month. "I can't believe this is still going on." The New York Times reports that an African-American woman — who remains anonymous — came forward this week with allegations of her own, saying O'Reilly would at various times grunt like a "wild boar" at her desk, leer at her and refer to her as "hot chocolate." 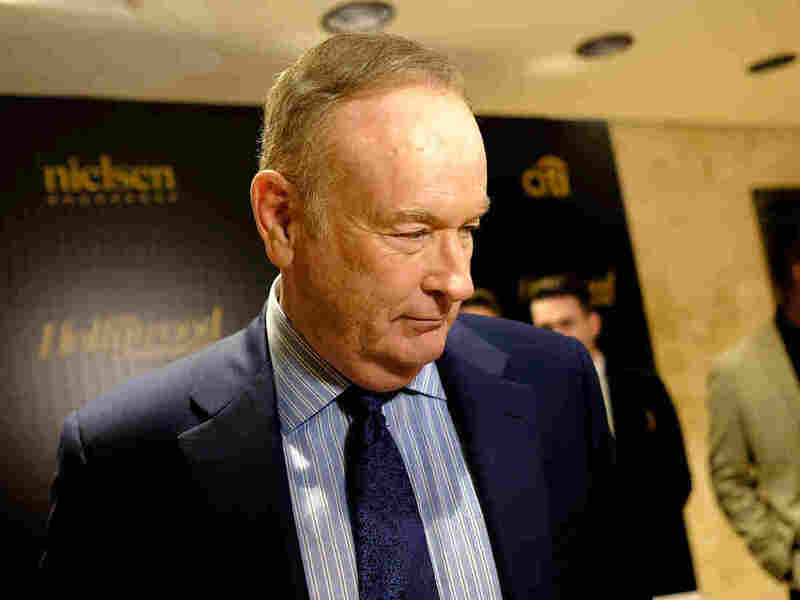 O'Reilly has largely remained quiet in the face of these accusations, though he has rejected them and said he agreed to the settlements only to protect his family. His lawyer has come out more forcefully, however. "Bill O'Reilly has been subjected to a brutal campaign of character assassination that is unprecedented in post-McCarthyist America," Marc Kasowitz said in a statement. "This law firm has uncovered evidence that the smear campaign is being orchestrated by far-left organizations bent on destroying O'Reilly for political and financial reasons. That evidence will be put forth shortly, and it is irrefutable." O'Reilly has enjoyed support in the White House, as well. "I don't think Bill did anything wrong," President Trump told the Times in an interview earlier this month. "Personally, I think he shouldn't have settled." "The real subtext to all this is that Roger Ailes, the founding chairman, the creative drive behind the success of Fox, was forced out last summer for sexual harassment. And right now, Fox is under the gun for this and also under a federal inquiry to see if it hid payments to women to try to keep it a secret — not only from the public but from shareholders, which could constitute a federal crime." Up to last week, the effects O'Reilly's scandal had on his program appeared mixed. As we reported last week, an independent analysis by the ad-tracking firm iSpot.tv showed O'Reilly's program had lost about half its advertisers in a span of several weeks due to the allegations. Yet his ratings did not seem to suffer, still easily hovering at the top of the cable news landscape even amid the poor press. O'Reilly — who has denied the claims — has been off the air since last week, when he announced he would be taking a vacation. At the time, O'Reilly said he planned to return to the program on April 24. It remains unclear whether the network will allow the host to say a farewell of his own on-air. Tucker Carlson will replace O'Reilly in the 8 p.m. ET time slot.